In protecting children, who have known violence throughout their lives, peacekeepers can break the cycle of violence and lay the foundations for durable peace. Why is child protection at the heart of peacekeeping? In many conflict-ridden countries, peacekeeping missions are the largest actor on the ground and their contribution is vital to protecting children. The Security Council has addressed this issue since 1999 and the protection of children in conflict has been included in the mandates of peace operations since 2001. In these past ten years peace operations have helped release thousands of child soldiers and advocate for legislative reform. How is UN Peacekeeping protecting children? We do this in countries where children face severe protection concerns, including abductions, military recruitment, killing, maiming. All teams within a mission have a responsibility to contribute to protecting children. CPAs work with other sections such as UN Police, Rule of Law, Human Rights, Judicial Affairs and the military, to ensure they consider children in their work. We contribute to reports to the Security Council, which not only exerts pressure on armed forces and groups, but also informs response and preventive action. For more information visit Children in Armed Conflict. Our missions negotiate Action Plans with armed groups to stop violations of children. Recently, action plans were adopted in South Sudan and the DR Congo. The Head of a Peacekeeping Missions is the highest UN authority in the country and has unique leverage with the government to advocate for the concerns of children. For example, in Darfur, UNAMID successfully advocated against the death penalty of former child soldiers. We work with national counterparts to strengthen their ability to deal with child protection concerns. For example, in South Sudan, UNMISS co-located a child protection officer with the SPLA to support the implementation of the action plan to end the recruitment and use of children. We promote the creation of new laws to protect children. For example: in our mission in Haiti our child protection unit lead the drafting and submission of a law against trafficking which was recently adopted. We use our radio stations, events and campaigns to make child protection issues widely known, and to promote ways to prevent violations against children in conflict. For example, in the DR Congo, MONUSCO together with the Government of DRC launched the campaign 'Plus jamais de Kadogo' to prevent the recruitment and use of children by armed forces and armed groups on DRC territory. 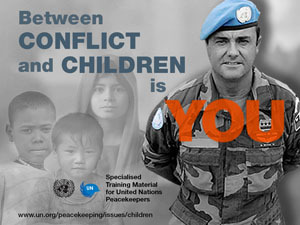 All CPAs ensure mission-wide training on CP so that every peacekeeper has the knowledge and skills to protect children. UNAMID created a training and resource center, where weekly trainings take place and staff can read about laws and problems of children. All United Nations peace operations personnel not only have the obligation to promote and safeguard the rights of children throughout their work and in interactions with national and local interlocutors, but also to adhere to and abide by the highest international norms and standards reflected in the body of law and guidance on children’s rights. Our work is guided by Security Council resolutions on children and armed conflict and the DPK-DOS-DPA Policy on Child Protection. Who are child protection advisers? Although everybody in a peacekeeping operation, including our military and the police, plays a role in protecting children. We also have special advisers who in those countries in which conflict impacts children most severely, help the mission channel their resources towards children. Advocating: the child protection adviser acts as an advocate, facilitator, and an adviser to the mission leadership on pertinent child protection issues. Child protection advisers play a key role in establishing dialogue with perpetrators to end the gravest violations against children. This dialogue has led to the signing of action plans by military and armed groups and the release. Thousands of military and civilian peacekeepers have received training on child rights and child protection issues form child protection staff. These peacekeepers deployed in remote and inaccessible areas act as the eyes and ears of child protection actors on the ground by providing information on violations and preventing violations against children by parties to the conflict. Dee Brillenburg Wurth is the head of child protection at MONUSCO in the Democratic Republic of the Congo. I’m in charge of a team of about 30 child protection officers who monitor and report on child rights violations on a daily basis. The information they gather is analyzed and integrated into the statistics of the Monitoring and Reporting Mechanism (MRM). Statistics are essential, but it’s important to never forget that every single child we report on has his or her own story on his or her life before the violation happened, during the violation, and surviving after the violation. This information helps us understand the dynamics and patterns of violations, the perpetrators, their methodology. This helps us develop prevention activities. For example, the recruitment of children by armed groups remains a huge phenomenon. Analysis helps us understand how the different armed groups are operating so we can do targeted prevention activities, and engage with the leaders based on a sound knowledge of their modus operandi. Links to CPA interviews and activities online: report websites. Pre-deployment training is essential for all military personnel. The Department of Peace Operations (DPO) has developed ground-breaking new training standards for military personnel. The training course teaches them how to prevent and report violations against children, how to interact with other child protection actors, and raises awareness about their own behaviour towards children. It is our aim that 100,000 peacekeepers are trained to become a protective force for children. The training materials can be downloaded from the UN Library. The following Security Council resolutions and policy govern the work of peacekeeping operations in protecting children. 20 November marks Universal Children's Day, a day to remember the children growing up in wars throughout the world, and to reaffirm our commitment to stand up for their rights and to take firm action. In this podcast, Lieutenant General Babacar Gaye, Assistant Secretary-General and Military Adviser to the United Nations Department of Peace Operations, talks about his personal encounters with children as the former Force Commander in the United Nations Organization Mission in the Democratic Republic of the Congo, and the successes and challenges in introducing child protection in the daily work of his soldiers. You can listen to the podcast here. Where do child protection advisers operate today?